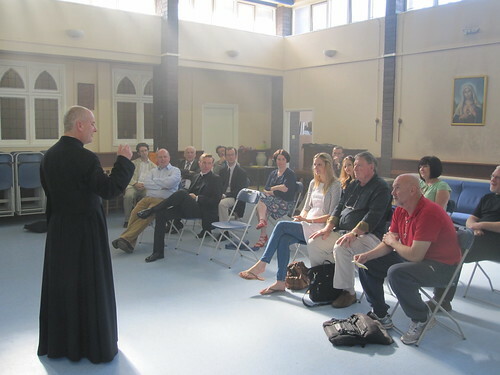 We then had a talk from Fr. Tim Finigan on being a Catholic blogger. He had much encouragement to give us all, along with some words of caution. I do hope that he will publish the text of the talk online, because it was excellent. 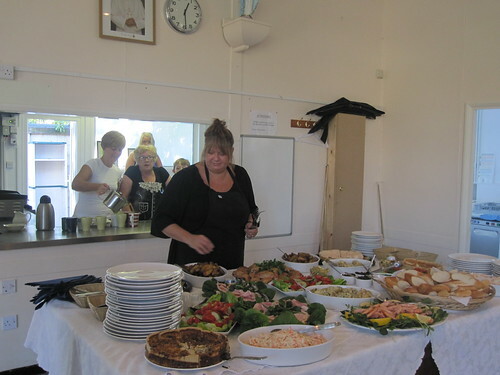 Lunch was provided in the large hall by Trish and her gang of helpers. Leutgeb was first off the mark in reporting the meeting, and lunch was declared to be yummy. I can second that: it was positively scrumptious! 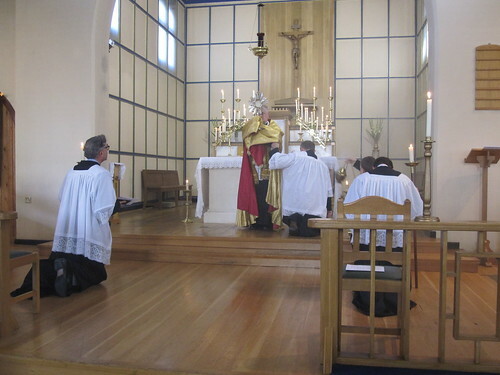 We had a brief business meeting, and then it was time for Vespers, which was for the Feast of the Dedication of the Parish Church. 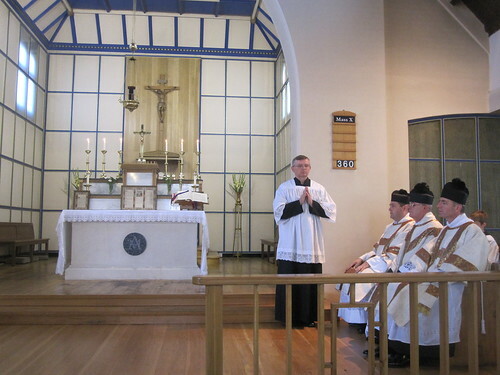 It was an enjoyable, edifying and encouraging day, and I was delighted to be able to meet up with people I'd only previously encountered online: so a warm hallo to Fr. Sam Medley, Fr. Simon Henry, Anthony, Stuart and Richard; and greetings to old acquaintances: Dylan, Leutgeb, Annie Elizabeth, Fr. Michael Clifton, Paul Priest and Hilaire Belloc. UPDATE: I forgot to mention that Vesper, who often comments, also paid us a visit! There are a few more photos over on my Flickr page. The Crescat has moved over from Blogger to Wordpress, and very good the new blog looks too. Remember to update your links! 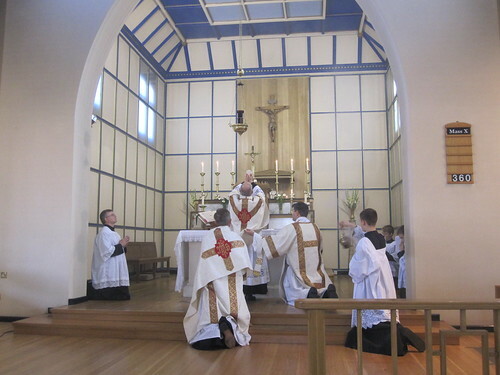 If brought up on charges of being a Catholic I hope there's enough evidence to convict me. A brain-damaged woman, who can only be referred to as "M," was at the centre of a High Court battle to have her food and fluids withdrawn. She has been in a minimally conscious state (having first been diagnosed as in a persistent vegetative state) for over 8 years, and her family wanted to end her life. That sounds rather harsh, but it is really just stating the truth. The family wanted to have her food and fluids withdrawn (though it's prettied up by calling it "stopping life-supporting treatment.") Effectively, that means that they would subject her to a horrifically painful death by starvation and dehydration - and, as in the case of Tony Bland, she would have needed painkillers to ease the suffering this entails. Yogi Amin, who represented the family at the High Court, stated that the ruling allowed the High Court to decide whether a minimally conscious person should be allowed to die naturally, with dignity. He didn't mention that death by starvation and dehydration isn't actually what one would consider a dignified death. Unusually, the medical authorities fought against the wishes of the family. They said that M was clinically stable, and the health authority pointed out that her life was not without positive elements. I must confess that I never thought a health authority would range itself on the side of the angels. Usually they're all for cost-cutting measures. Fortunately for M, and possibly for others in a minimally conscious state, the judge ruled against the family. Quite apart from the self-righteous tone used by Baroness Flather in suggesting that the poor have too many children, particularly those from Pakistani or Bangladeshi communities, and that this really isn't necessary in Britain because of the welfare state and pensions (oho... someone hasn't been reading the news lately! ), I rather object to the fact that none of the MSM have been open about the Baroness' vested interests in making such statements. Baroness Flather is a director of Marie Stopes International. Massive twitch of the mantilla to Red Maria for highlighting that little connection. I stopped off at Boots to visit the Clinique counter. I've used lots of makeup over the years, and have discovered that cheap brands do not pay. My skin is quite temperamental, and Clinique really suits me best. 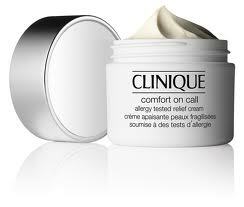 The moisturiser I use is the Comfort On Call one - it soothes the slightly irritable flakiness I have a tendency to develop. To my surprise, the counter was completely deserted. I waited patiently, assuming that the assistant was on a break. Eventually a young woman turned up, and I explained what I was looking for. She was very apologetic, explaining that she wasn't a Clinique specialist (there had only been one on earlier, due to sickness) but she'd seen the variety I wanted, and she said she'd look for it. I promptly plumped myself down on one of the make-over chairs. The first assistant wasn't having any luck, so she called over another assistant and they both started rooting through cupboards. We had a good chat about different moisturisers, and I explained that this was my favourite. Then the first assistant called over the supervisor, to ask if she could check the stock cupboard. Feeling in need of a little refreshment before heading home, I stopped at the Krispy Kreme shop. As I bought a hot chocolate and a mango creme doughnut (a new variety, which, really, doesn't quite work) the assistant asked if I'd like a complimentary glazed ring doughnut, hot from the oven. Those little acts of kindness quite lifted my spirits. I love my little snazzy camera. It has served me well over the past couple of years, and I've taken some very good photos with it. However, this has rekindled my interest in photography - I have several old photo albums with "real" photos - and I decided that the time has come to upgrade. I am not going to go the whole hog and buy a camera and a slew of lenses to be screwed on at crucial moments. I realised that what I actually do want is what is popularly known as a "bridge" camera - one down from the DSLR and one up from the point-and-click compact that I currently have. By dint of several visits to Jessops (big, serious camera shop) and shops like Currys, I have narrowed it down to two possible choices: the Canon PowerShot SX30 IS and the Fuji FinePix HS20 EXR. The Canon has the longer zoom - 35x optical zoom, 14 MP - and the zoom is button controlled (I can't remember the correct term, but I'm sure you understand me.) 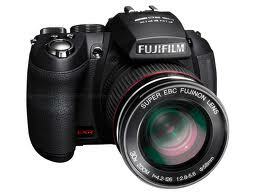 The Fuji has a shorter zoom (30x) and it's manual, but the picture is 16 MP. Part of me is very tempted by the longer zoom. I also quite like the button-controlled zoom. However, my current Canon camera is protesting when I use the automated zoom (it's on its way out, hence the need for a new camera) and I am wondering whether a manual zoom might be better - the less automated bits there are, the less there is to go horribly wrong. Then again, there's the battery. 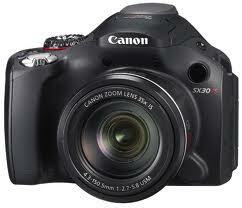 Canon has a lithium-ion rechargeable battery unit. Fuji uses AA batteries. I prefer the former, but maybe that's just because, back in the mists of time, rechargeable AA batteries used to be such a pain and never actually lasted any length of time. Maybe they've improved. Mind you, since I have to save up the pennies before I can actually get round to purchasing one of them, I have got a bit of time in which to dither. However, if any of you people out there know of any good or bad things about these cameras (from personal experience, that is - I've already read several reviews online) I'd be delighted to hear from you.